An unusual book turned up from a collection in Belgium this week. To all outward appearances it’s a paperback copy of volume 4050 ‘The Statue’ by Eden Phillpotts and Arnold Bennett, with first printing wrappers dated July 1908. Inside however are bound the pages of a completely different book - volume 3950 ‘Benita’ by H. Rider Haggard. 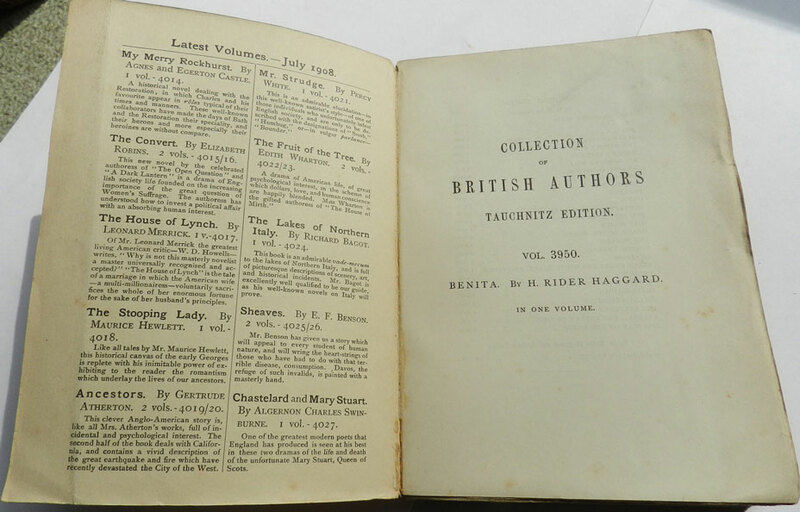 This also appears to be a first printing copy from over a year earlier in February 1907, and has the catalogue for that month bound in (and the corresponding monthly descriptive list laid in as well). I can only speculate about how such an error could have happened. The wrong wrappers cannot have been added any earlier than July 1908, which seems to suggest that the pages were at that stage still held in stock without any wrappers. That makes some sense. The initial print run might be larger than the confirmed orders, and any retained copies would only have wrappers added when additional orders were received. You might think though that they would also have catalogues added at the same time, so that all the Tauchnitz advertising was up to date, and other Tauchnitz editions with later dated wrappers tend to follow this pattern. So it seems odd that it still has the February 1907 catalogue. Then is it relevant that number 3950 has got mixed up with 4950? Is it just a coincidence that the numbers are exactly 100 apart? If they were stored with 100 titles in a row, might 4050 have been above or below 3950, so that the wrong book could easily have been picked up? Or were the numbers just confused in someone’s mind, so that they picked out 3950 when they should have been picking 4050? Was the error made only on a single book or on a whole batch? There’s no record in Todd & Bowden of any other copies bound like this, although there are examples of other binding mistakes.